There are many reasons you might need to remove a tree from your yard, but not all homeowners realize the importance of removing the remaining stump, too. If you hire a tree removal service for storm damage cleanup, to remove a diseased or dead tree, or because you need routine tree trimming, don’t be surprised if they recommend removing any tree stumps they see. Tree stumps provide a hazardous barrier for children and the elderly who might not see stumps while walking or running in your yard. If a stranger or neighbor fell over the stump and injured themselves, you could also be liable for a personal injury lawsuit. Besides being a tripping hazard, old stumps can also damage landscaping equipment such as lawn mowers. Decaying trees are like buffets to beetles, ants, termites, and other wood-eating pests looking for a safe place to nest. Left alone, those pests can eventually venture out and discover nearby houses. The last thing you want is an infestation in your home because you failed to hire a tree removal service to remove and grind up any old tree stumps in your yard. While new trees might sound like a good addition to your yard, the sprouts that could emerge around your old tree stumps will be small and unsightly. Plus, they can act like parasites, taking away much-needed water and nutrients from other plant life in your yard. 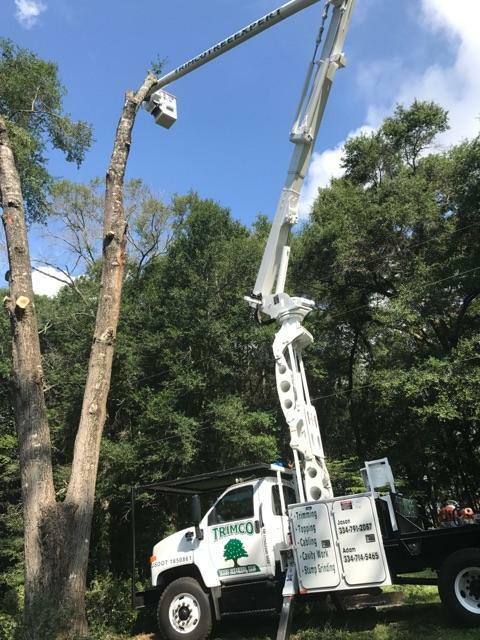 If you need a tree or tree stump removed in Midland City or Dothan, AL, the tree specialists at TrimCo Tree Experts specialize in tree removal services. Their team of arborists also perform tree trimming and pruning to improve the health of many species of trees. They also have workers’ compensation and are trained and certified to handle every kind of tree service your property needs. Call (334) 791-2087 to schedule an appointment for services in Dale, Houston, Henry, and Barber counties, or visit them online today to learn more about the company. You can also find more information about their services on Facebook. Can an Arborist Save My Leaning Tree?